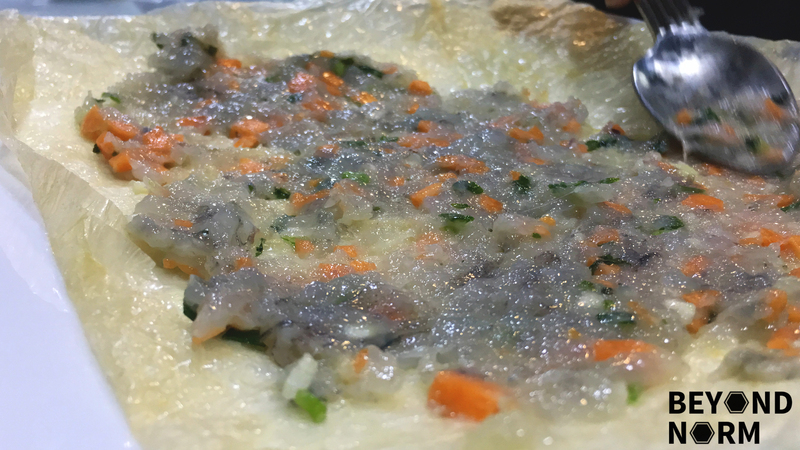 Recently, I have been experimenting on how to make this crispy Prawn Pancake like Din Tai Fung (鼎泰豐). Coincidentally, when I was in Miri last week, I saw this exact pancake being made by a chef from China on one of the TV channels. This gave me a motivation to try it again and off I went! I made this again last night and the taste was great but sadly I didn’t succeed in making it crispy. 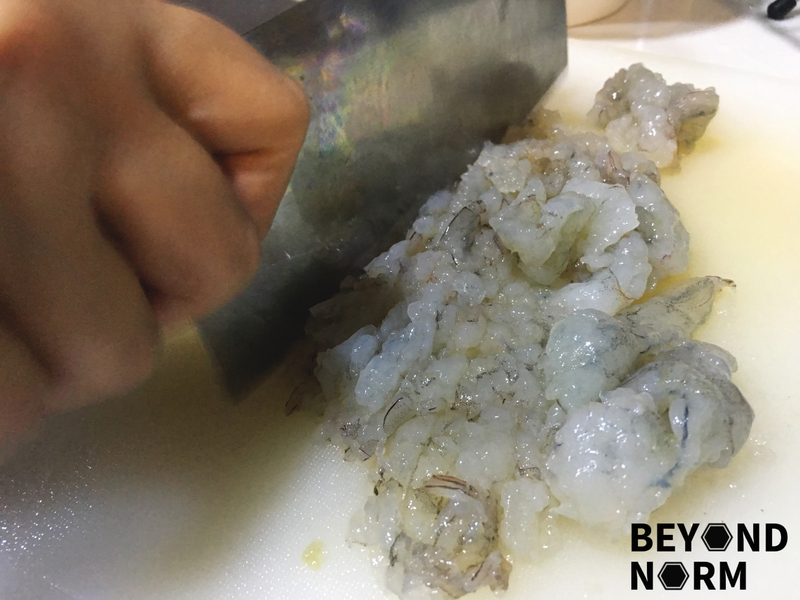 After so many failed attempts to emulate the DTF Crispy Pancake, we (my family) decided to do a post mortem on why the prawn pancake failed to be crispy. 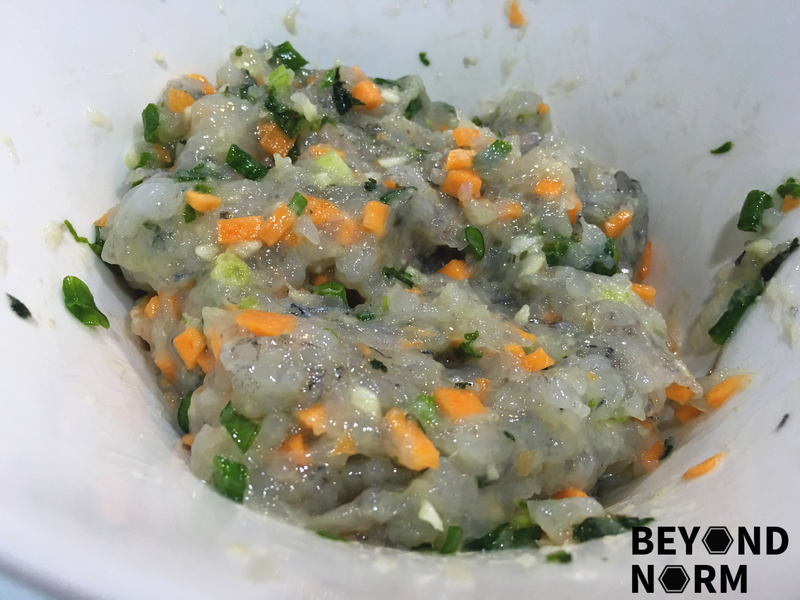 Our conclusion was I added more prawn paste and so the skin has more moisture, whereas DTF’s layer of prawn paste is much thinner. 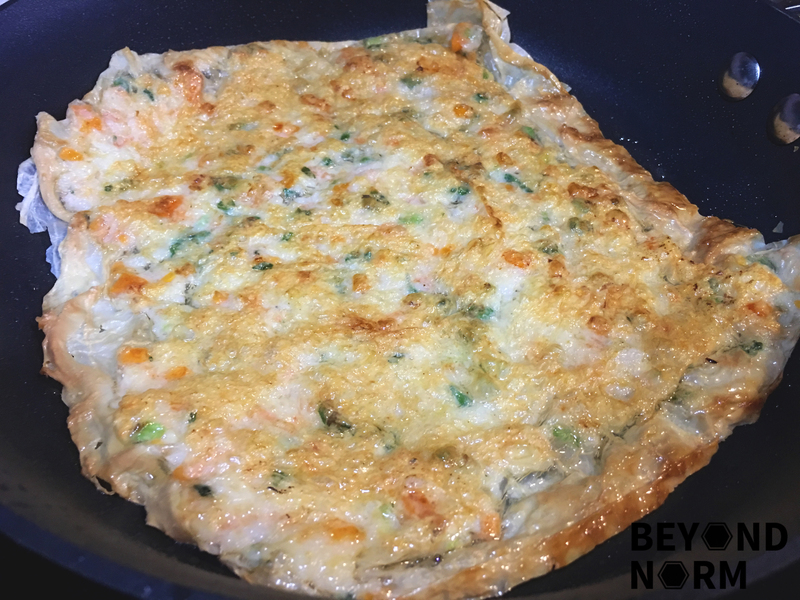 Oh well, we enjoyed this prawn pancake which I have made so we’re sharing it with our fans. Hope you like it too!! If you tried this recipe, be generous and give us some feedback/comments via our blog. We would also like to welcome you to join our Mummy’s Kitchen Facebook Group for food lovers like you, whether newbie or veteran. You can like us on Beyond Norm’s Facebook Page and subscribe to our blog. Follow us on Instagram and YouTube @beyondnormblog to get the latest updates and videos. Add the carrots, garlic, toasted sesame seeds, coriander and spring onions into the minced prawns and combine well. Lift the prawn paste and slap it against the bowl. Repeat this step a couple of times to give it a bouncy texture. Marinade the paste for about 30 minutes or more. Cut the dry bean curd sheet into 6 inches x 4 inches or you can cut it according to your desired size. Spread the prawn paste on one piece of the cut bean curd sheet and leave some allowance on the side. Place another piece of bean curd sheet on top and seal the sides with the egg white. Heat up some oil in a non-stick pan on medium-low heat. Flip over to pan fry the other side till golden brown or prawn paste is completely cooked. Dish out and cut into smaller pieces and serve immediately with steamed rice or fried rice. Keep the shell of the prawns to make stock. As I did not clean the salt on the bean curd sheet, I did not add any salt to the prawn paste. I used a non-stick pan so that I used less oil to pan fry the pancake. Hence it is less oily. Note: My recipe was adapted from dingoozatfood and wokking mum.